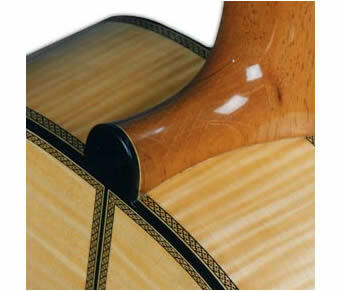 On request, I build highly sophisticated Classical Guitars with detailed, ambitious ornamentation. An example of such a detail is the hand-made purfling which I fit to the edges of these guitars, as well as the rosette, bridge and head which can all be embellished. These adornments are usually an expression of my personal affinity to the Spanish guitar-making tradition. My Japanese dealer, Eisuke Ozaki, came up with a very good idea for improving the playability of the broad 10-string fingerboard. He suggested “shifting” the neck “upwards”. This I do by joining the neck to the body in a way that the median line of the broader fingerboard is shifted 10mm away from the median of the body in the direction of the bass-strings. The Japanese guitarist and teacher Y. Iwanaga and many of his students play on these asymmetrical instruments. „Collector´s series“: Auf Wunsch fertige ich auch sehr anspruchsvoll verzierte Konzertgitarren an, bei denen z. B. auf allen Korpuskanten von mir angefertigte Intarsien verarbeitet sind. Ebenso sind die Rosette, der Steg und der Kopf aufwändiger gestaltet. Ich möchte damit meine – nicht nur – ästhetische Verbundenheit mit der spanischen Gitarrenbautradition ausdrücken.